As a child in the desert kingdom of Gryth, Ivory witnessed the brutal murder of her parents at the hands of a sinister race known as the Lecs. Now Queen of her people, a vengeance-fueled Ivory launches a final battle to annihilate the enemy once and for all. But on the eve of war, betrayed by her own kind and left in the hands of the Lecs, she's forced to learn the shocking truth about their two peoples, and the diabolical curse that's plagued them for centuries. 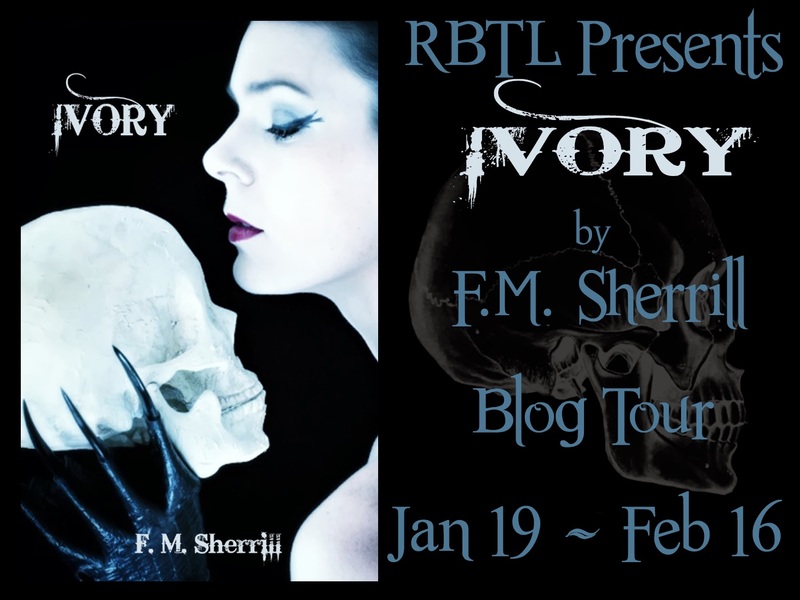 Armed with newfound knowledge and unexpected allies, Ivory must face the real enemy that's haunted her all her life, and make a choice that will mean the difference between a new beginning and the end of the world. 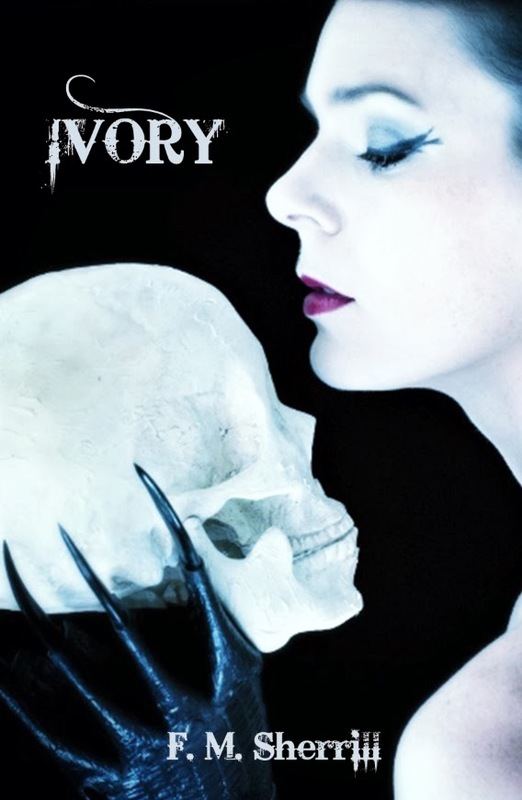 Ivory is an exercise in duality made reality; an exploration of darkness and light, male and female, sun and moon… seen through the eyes of two cultures ripped apart by an ancient evil whose pain resonates through the ages like the beating of a drum. Aren't author's bios boring? I always wanted to read one that went something like this: F.M. Sherrill: recent citizen of earth. Plans on ruling the planet once she gets over the common cold. Or, F.M. Sherrill: time traveler. Decided to alter the space-time continuum by writing a novel, thus changing history slightly, which will eventually lead to the rise of a new human species. But here it is. F.M. Sherrill is a novelist, A.K.A. an avid bullshitter; that's why she lives in L.A.. She's been writing for as long as her ancient mind can remember, devouring tales like an anemic vampire roaming the streets in hot pink heels, always thirsty for more. 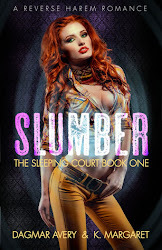 When she's not writing, she's making steampunk weapons, sewing giant plant-eater Mario plushes, making costumes for some film bloke or cosplayer, and sculpting/casting movie prop replicas while gardening in her urban apartment. Her favorite tools? A soldering iron, a blowtorch, a band saw, a sonic screwdriver, a replicator and an active imagination. EXCERPT "She pants for breath, sweat cascading down her back. It moves over scars and soaks through the white fabric between her flesh and armor. What is he staring at? He waits at the tip of her blade, his eyes green like fields of summer. He’s dead and he knows it." This book wasn't at all what I was expecting and to say I was pleasantly surprised would be an understatement. It was dark, showing just how far the shadowed emotions of human kind can push you. It was written beautifully, with just the right amount of creep and horror to keep you fascinated, but not disgust you to the point of not being able to finish. It was dark, but so very well written. I look forward to reading more from this author. I love her bio...very interesting indeed :D adding this to my wishlist. Thanks Nikki! 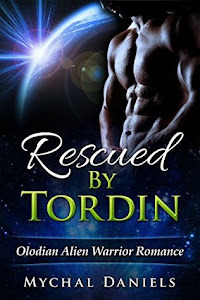 Shifter Romance Box Set :$0.99!!!! Hearts on Fire Blog Valentine's Hop Signup!!!! !